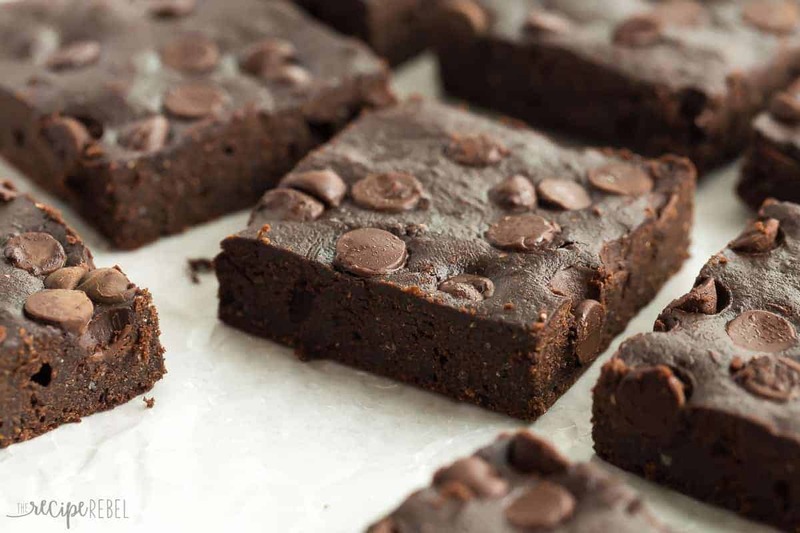 These are the BEST healthy brownies! They are SO fudgy and made with whole wheat flour, coconut oil, applesauce and have reduced sugar. So, here we are: January. How are those New Years resolutions going?? I’ll be honest, I don’t usually make much for resolutions. I try to just eat healthier on a regular basis, with the odd treat thrown in here and there. It just kind of turns out that around Christmas, there’s a lot more here and there, and here and there. My goal this month is to bring you more healthy variations and makeovers of your favorite comfort foods, so that you can enjoy them all year long without feeling guilty about it! Yes, even treats. I was blown away by how well these turned out on my first try. Dare I say, they were perfect the first time. My goal was to cut out most of the fat, sugar and use whole grains. I based this recipe off of my recipe for The Best Brownies Ever (because I know you already love that one! ), but I reduced it to make only an 8×8″ pan. I did this because I was sure it was going to take me a few tries to get it right and I didn’t want 3 9×13″ pans of subpar brownies laying around. Except it turns out, they were incredibly rich and fudgy and delicious. I was most nervous about cutting out a lot of the sugar. My normal recipe would have had 1 1/4 cups of sugar in an 8×8″ pan. This recipe has only 1/2 cup. It has a rich, dark chocolatey flavor but they are sweet enough. My kids loved them, so you know they still taste like a treat! I used a combination of unsweetened applesauce (this helps to add a bit more natural sweetness!) and melted coconut oil. This was my first time using coconut oil, and I just wanted to try it and see! I know it’s getting to be A Big Thing (yes, I’m behind the times!) and I wanted to see how it would work to make super fudgy brownies. So well! So if you’re looking for a healthier treat that doesn’t taste like a sacrifice? These are for you! Preheat oven to 350 degrees F and line an 8x8" pan with tin foil or parchment paper. Grease lightly with non stick spray. In a large bowl, whisk together coconut oil, applesauce, vanilla and eggs. Add in flour, cocoa, and sugar and stir until combined completely. Spread into prepared pan, sprinkle with chocolate chips and bake for 15 minutes or until a toothpick in the center comes out almost clean. The brownies should still be glossy on top in the middle, but look dry at the edges and the toothpick may have some moist crumbs. Preheat oven to 350 degrees F and line an 8×8″ pan with tin foil or parchment paper. Grease lightly with non stick spray. I love this recipe and used 1/8 cup of brown sugar & 1/8 cup of coconut sugar instead of the granulated. This makes it less processed and more natural. I am also wondering how coconut or almond flour would do but I used whole wheat flour and these turned out great!! I also used 1/2 vanilla chocolate chips and 1/2 dark chocolate chips (65%) cacao (healthier chocolate). 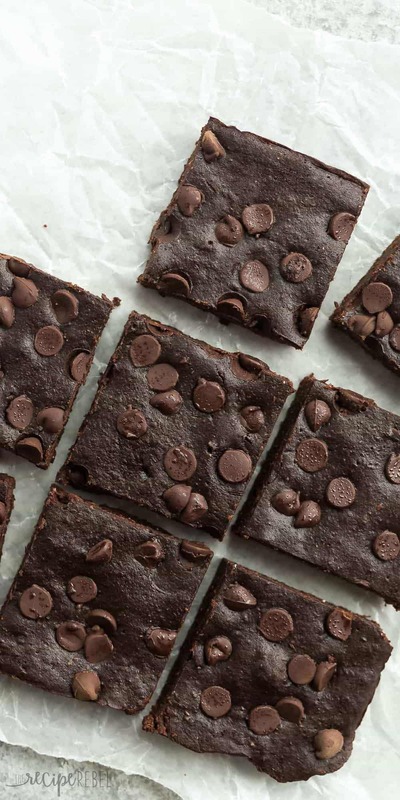 what are the health benefits for this brownies? Can you substitute cane sugar in this recipe? I’ve never tried, but I’d love to hear how it goes if you do! 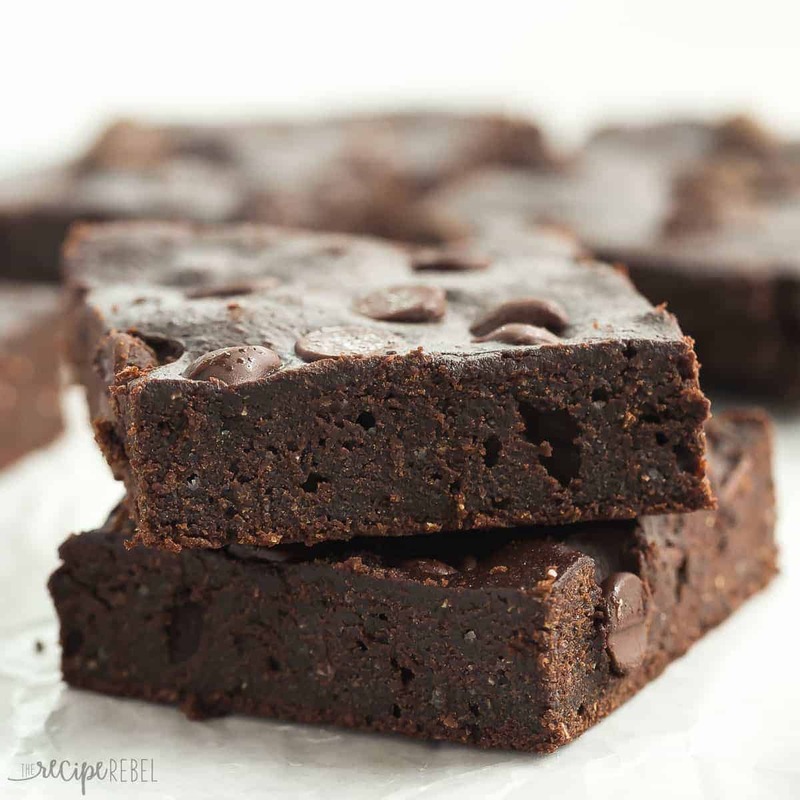 I love coconut oil brownies – it seems to make them extra fudgy! Love the applesauce in here too. They look SO good – almost like pieces of fudge. My kind of brownies!! This was my first time using it! I think I’m hooked. So good! Thanks Rachel! Do the chocolate chips get mixed into the batter? Sorry, I’ve updated the recipe! I sprinkled them on top. Healthy brownies was the only thing I needed to hear!! 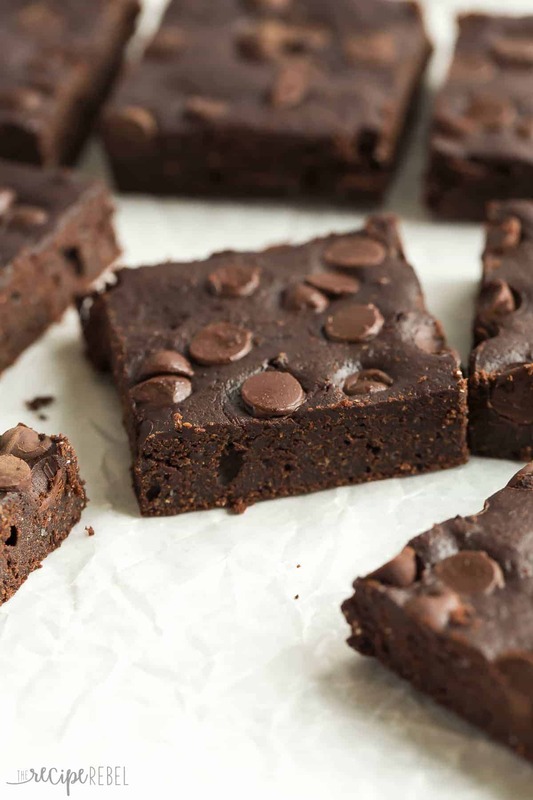 I’m a huuuuuge sucker for fudgy brownies and these look absolutely insane, Ashley! Yes! It adds so much moisture and natural sweetness. I couldn’t believe how good they turned out! Ashlry Fehr, These look so good, that its making my mouth water. I see you use coconut oil where can i get that kind of oil? Please Respond back and let me know, can i use unsweetened apple sauce in a can? Hi Judy! You can definitely use unsweetened applesauce from a can. You can get coconut oil in the health foods section of any grocery store! I use the refined and then it doesn’t taste like coconut. can another oil be used? I usually use a very light olive oil so it does not have a strong taste. I use refined coconut oil so it has no coconut flavor. I’m not sure about using a liquid oil, but butter would work for sure.